Fairies are kind of a big deal in our house. Our fairies have helped my daughter ditch the dummy, give up her nappies and are always around with sprinkles of fairy dust to help us when she hurt ourselves. So, fairies are quite important to us. Now that summer is well and truly here we have decided to create a little space for the fairies to go as they please in the form of a magical fairy garden. We couldn't wait to get started but I couldn't believe how expensive a magical fairy garden could be, so I wanted to try and create a magical fairy garden on a bit of a budget and with the help of Gardens2You and a bit of creativity we are able create our very own fairy garden. Gardens2You offer a unique collection of garden fairies and fairy doors that are sure to add a little bit of magic to your garden. There are a wide range of options available which are perfect to help children get excited about being in the garden and create a place for their fairies. You can choose from a differing range of sizes, shapes and colours that will be sure to match anyone's tastes. If you are looking for a few pieces to add to your fairy garden or want to start your own, then Gardens2You will only be too happy to help you create a magical corner in your garden. 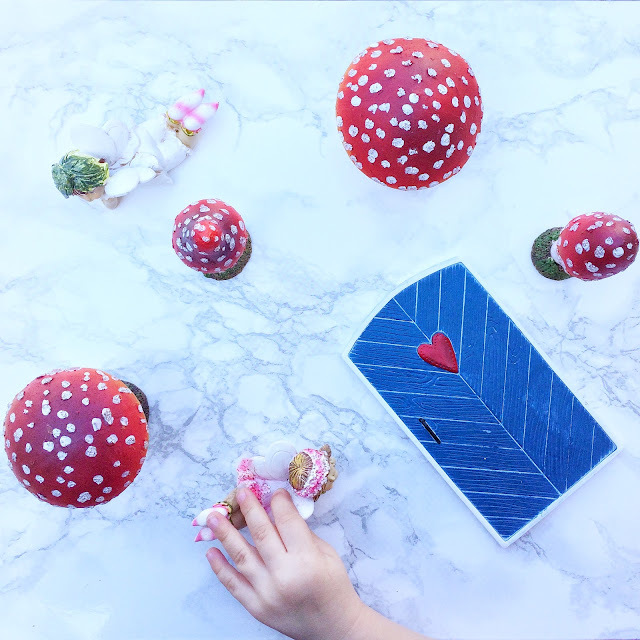 We decided to go for a fairy garden starter kit to help us build a magical and enchanting area in our garden, that will not only attract fairies but to ignite the imagination of my little girl. This set comes complete with 2 small and 2 tall red head toadstool mushrooms and a detailed, wooden look blue door! Our fairy garden wouldn't be complete without fairies so we got these cute little laying flower fairies in a soft, neutral coloured pallet and detailed design. First things first, we needed to find a little place for the fairy garden. If you are trying to create a magical and enchanting place for your fairies why not have a look around your garden to see if you can use a little creativity. A tree trunk would make a great container, as would an old wooden planters, or even broken flower pots. With a little bit of magic you will be able to try and create the perfect base for your fairy garden, then look around the garden and your home for any pieces that could offer a great start for your fairy garden. Bark, slate, stones, string, lolly sticks, or even small toys. We decided to use a space in the garden that was just for our daughter. We have just planted some sunflowers so it may take a little while to bloom but for now we have placed our fairy garden ornaments around them. However if you don't want to wait for your fairy garden to bloom head over to a pound shop. You will find an array of finds in there such as dry moss, wooden sticks, decorative stones, gems, paints to help create the magic. In addition to the pound shop finds you could then go in search for some miniature plants to add to your enchanted garden, just like these ones. Once you begin to set up your fairy and if you budget allows it, get yourself a few special items such a table, chairs or even a mail box. We had so much fun planting the flowers for our fairy garden and cannot wait for them to bloom, it was great to get outside and I'm sure we will continue to add to our magical corner of our garden. Do you have a fairy garden? If not, why not try and create one on a budget! 4 comments on "Let's Make A Fairy Garden"
You are so lucky to have such helpful fairies! What a gorgeous idea to create a fairy garden, the little fairy ornaments and accessories are so charming, and they will look gorgeous when the flowers grow around them too. Fairies only visit oour house when teeth fall out now, and even then they sometimes forget!! Oh those fairies are lovely. I love the idea of creating a fairy garden. My two would love it and it would help spark their imaginations. Have you checked out The Irish Fairy Door company? Lots of lovely fairy-related bits and bobs.